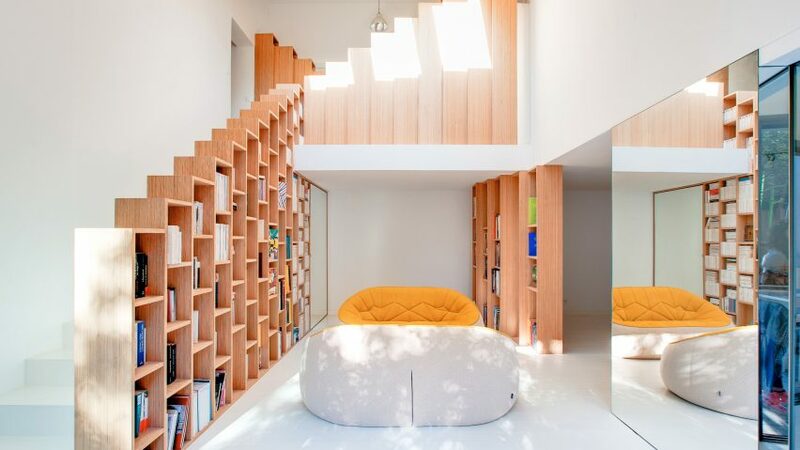 Stepped bookshelves help to divide and characterise this house just outside of Paris, renovated by Italian architect Andrea Mosca. 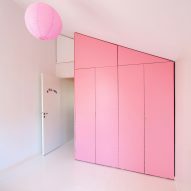 Mosca designed the interior for a family of five, who were enamoured with the room-length bookshelf at a friend's house, where they were staying during the remodelling. 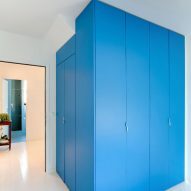 He made the element a feature of the home, which he calls Bookshelf House. As well as providing a place to display books, the beech wood shelves act as stair bannisters, room dividers and general storage within the three-storey property. "After some tests, I decided to imagine a standard bookshelf element that could populate the space, playing different roles when needed," said Mosca, who has been based in Paris since 2007. Rather than flat shelves, Mosca designed the bookcases to look like stacked boxes. The largest unit extends from the first floor to the mezzanine, serving as the main bookshelf in the living room as well as a bannister on one side of the stairs. Its stepped top continues on the mezzanine level, where it serves as a storage cabinet. The main shelf is reflected by a large mirror on the opposite side of the living room, making books a dominant feature of the space from almost any angle. 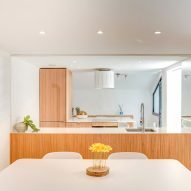 Outside of the shelving, Mosca's brief for the previously dark, run-down home was to make it brighter, add an enclosed office on the mezzanine and create a separate kitchen filled with natural light. He enclosed the kitchen in a big glass panel and sliding door to let in as much light as possible, while also creating views to the book-filled living space. 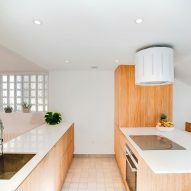 White-painted wood floors bounce light around the home, with beech wood cabinetry adding warmth. Book lovers have been responsible for many innovate shelving projects in interior design. A 17-metre-long bookshelf lined one house in Hungary, while every step became a staircase in a London house.